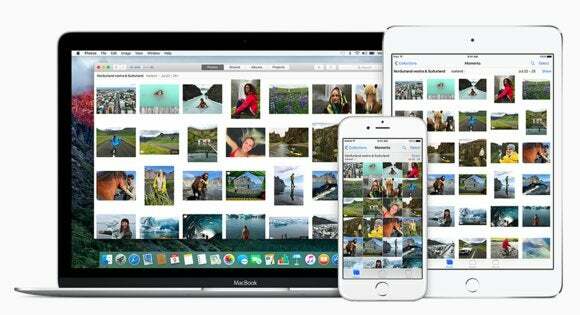 Take extra care if you want to upload many photo libraries to one iCloud Photo Library. You could end up with duplicate photos. Rob Rosenbaum has a slightly terrifying question. He’s been syncing photos from a single iPhone to two different Macs via USB—just importing them on each Mac. He is about to turn on iCloud Photo Library, but he wonders. Once I turn this on for the first time, will iCloud import everything from all three? Even if it’s the same photo? Will anything be erased? Before you change any settings, I recommend making a full local backup of all your libraries, just in case. Photos and iCloud Photo Library is much better and more stable than in its earlier releases, but you never know what might happen. Next, I’d suggest picking one device to start with. Don’t enable the feature on your phone and two Macs at the same time. Picking one of the Macs makes the most sense. Consider how long it might take to sync if you have gigabytes of photos, and check your ISP’s rules about monthly usage and overage fees or caps. Once that first library has synced and is up to date, then you can proceed to the others. What should happen is that you wind up with a merged set of all photos across the three libraries. No media should be deleted. And Photos should be smart enough to not upload identical images, either to check them to see if they’re already there or to store as a duplicate. You should wind up with a single copy of identical images and videos. However, in my testing, I’ve definitely seen Photos for Mac seemingly upload every single media item even when my iCloud.com account contains exactly the same photos and videos. So you should prepare yourself for a long process. Once you’re synced, however, everything you upload and every change you make is then propagated across all your devices and iCloud.com without further intervention.